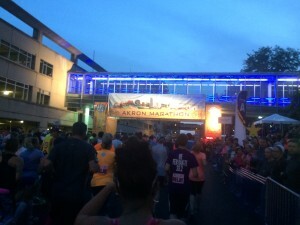 The Akron Marathon organizes great events and we have lots more coverage for you to check out. You can read about Mike’s first attempt at the relay event in his Worst Race Ever feature, his redemption story at the 2013 Akron Half Marathon, and his joy in following the Blue Line during the 2014 Akron Half Marathon. You can check out our Youtube Videos from the 2014 race weekend and the 2015 Rubber City Race Series [COMING SOON! ], which also included the Inaugural Thirsty Dog 8k and Goodyear Half Marathon. After finishing the 2014 event, I thought I might take a break from the Akron races for a year or so…BUT – and there is always a “but” – they sucked me back in. First, they redesigned the half marathon course, so I knew it would be a fun and new experience. Second, they introduced the Rubber City Race Series, which meant more events such as the Thirsty Dog 8k and Goodyear Half Marathon, and cool new bling. So yeah, I was back for yet another year of half marathoning in the Rubber City! There was very little lead up to this race for me. I was trained up since I completed the the Rock Hall Half Marathon and Green Cathedral Half Marathon, so I just kept my training program where it was and worked in a 5k shakeout run the morning before the race. The race expo begins with a blue line! Steve, Candace, and I all ran this race, so we stayed about 30 minutes away and made sure each other were up and going on race morning. Parking in downtown Akron is so easy that it would be hard to find a large race event with easier, closer, or freer (is that even a word? Oh well, it works here, so I’ll go with it) than downtown Akron. Akron always does their expos right. 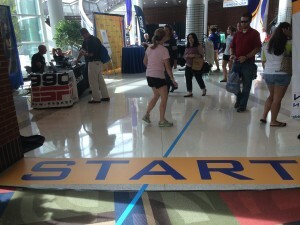 They are at the downtown Knight Convention Center and are always well laid out and easy to navigate. Definitely amongst my favorite expos. You can check out more discussion of this race expo in my past reviews (See: 2013 & 2014), but you should know two things. First, the expo has a blue line! Yes, an actual blue line! Second, because of this blue line, you cannot get lost. Just follow the blue line and you will visit every station and vendor you need. It is a great design concept for an expo. Race organizers call these things “premiums,” but we Casual Runners call them “swag,” and Akron always brings their game when it comes to swag. For this race we received long sleeved tech shirts. Honestly, these shirts are not my favorite, I liked the ones from prior Akron races better, but you cannot win them all). I am also not a fan of white race shirts in general because they get dirty too easily. 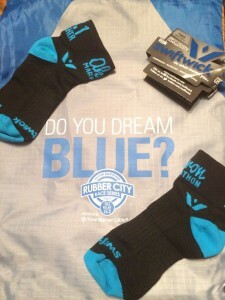 That being said, organizers made up for it with nice custom event nylon cynch bags and socks that are blue – in honor of the blue line! Definitely a good value for this event. Once again I sported my Team Casual Runner running singlet to represent the Team, and to be twins with Steve because that is how we roll at Team Casual Runner. The rest of my race kit consisted of Layer 8 running shorts, Adidas Climalite compression shorts, Steigen running socks, a Sweatvac hat, Sqoosh sport bands, Soleus GPS+ watch, and Saucony Virrata running shoes. I also had my Iphone 5S, Yurbud Ironman Series headphones, and a Ziploc bag for moisture protection. As I once again knew I would be sweating a lot, I applied a generous amount of Body Glide to prevent chafing. As I said, parking in downtown Akron is easy and abundant on race morning, which is impressive given the size of the field. They moved the starting line this year and hit a home run in doing so. The pre-race area, which was immediately adjacent to the starting corrals, was set up on the ground floor. This was awesome. It was a little cool on race morning, and being semi-enclosed meant we experienced very comfortable pre-race temps. Also, had it been raining or worse, we would have stayed dry under the roof while waiting to use the bathrooms. So, nicely done organizers! Now, to be honest, there is one big disappointing aspect to this race. While the race technically has a corralled start, it really is one big mass start. There are 3 large corals, which admittedly had plenty of room for runners and are easy to access. However, the corrals are so large and the release is not staggered, thus making the race a de facto mass start. For us, this meant a very congested, slow start to the race (the pacer I was with for the start was more than a minute behind her pace for the first mile because of this). If they could figure out a way to adjust this, it would help to further improve what is otherwise a great event. Remember how I said organizers created a new course for this year? Well, yeah, it was pretty awesome and the changes deserve some solid praise. We started off in Downtown Akron as usual, where large crowds cheered us on. We headed north along the Y Bridge as in past events, but instead of turning west we continued north. This allowed the course to open up and greatly reduced the congestion. I was pleased by the abundance of water stations and portable bathrooms throughout the course, and had to avail myself of both throughout (yeah, I didn’t quite take the Team’s advice on planning my pre-race diet all that well). As we made our way through Akron’s north side, we passed a few bars that opened early and whose patrons came out to cheer us on, which is always a welcomed sight on race morning. Speaking of welcomed sights, we passed a sign declaring the stretch of the course to be the “Swenson’s Milkshake Mile.” I knew we were near Swenson, but, could it be? YES! Employees greeted us with cups of milkshakes! I am not saying that heavy lactose drinks are ideal mid-race beverages, but they were delicious. Thank you Swensons! We mad 2 sharp rights and then began climbing some hills, where we were greeted by local residents who had set up a full bar on their front lawn for the passing runners. I could have had my choice of beer, rum, and even bourdon, but after the milkshake, I decided to pass and kept on climbing. We made our way through the north side neighborhoods and down a hill before we turned left to make our way back across the Y Bridge and back into downtown, where we turned left onto the campus of the University of Akron. It should be a rule that every race should go through a college campus AND they should have a garage band stationed so its speakers are blasting directly at a college dorm. There were more than a few bleary eyed college students who came out to watch us simply because the band ensured they could not sleep off their hangovers. Again, well played and highly-entertaining! The in-stadium finish line and finishers’ village. We passed through downtown again and made our way into Akron’s west side, which was another completely new feature of the course. This is where I started to run out of gas. I was foiled by poor pre-race fueling options and didn’t consume any of my gel packets for fear that I would cause too much rumbling in my tummy. I simply ascribed to my old adage: Accept. Adjust. Advance. Unexpected Magic Humor. Once back into downtown the crowds picked up again. I saw a young boy no older than 5 or 6 who did not look like he was enjoying himself. I went up to give him a high five, and his face lit up…just as the woman next to him, who was so excited thinking I was giving her a high five, put out her hand and accidentally smacked the little boy in the face. His reaction was both priceless and hilarious. He was a good sport and all were ok, but it was definitely a memorable moment. I also saw two little girls standing out IN the course to give high fives. I was afraid for their safety and urged them to get back on the curb, but they did not listen. I hope they were ok, and I still have no idea where their parents were. We did a tour of downtown as we could see the stadium finish to our left, and then the marathon and relay runners split off from us as we made two lefts onto Main Street and began our final push to the finish. Buoyed by adrenaline and feeling better I got a little pep in my step and started sprinting towards the finish. We rejoined the end of the marathon course and ran side-by-side with the fastest marathoners for the last .3 miles (er, we were next to them momentarily before the smoked us!). The finish at Akron is great, you make a right turn into the alley behind the scoreboard of the baseball stadium, which is a little crowded, so you have to be careful. This minor inconvenience is a small price to pay as you make a sharp left and enter the baseball stadium, full of cheering spectators and live music as you sprint towards the finish line at first base. It was an awesome finish. No PR for me on this day, but I didn’t care. I enjoyed once again following the blue line and another successful Akron Marathon race event. I have mixed feelings on the half marathon medal. It really is nice, is of very good quality, and I appreciate that organizers do change the design every year, but it is a little on the small size for a half marathon medal. I know, I am hard to impress, but I am being honest. The ribbon is a nice custom ribbon that compliments the medal very well. So yes, it is a nice medal, I just wish it was a little bigger. Geeze, I am a tough critic. Now, for the challenge medal. As Steve and I completed all 3 legs of the Rubber City Race Series, we received the bonus medal. This is a nice, big medal that also has a very nice custom ribbon. So props on this one. The only slight problem was that I had trouble finding where to claim my medal. At first I had completely forgotten about it until Steve reminded me. Then we had to exit the finisher’s village, go up the stairs to a pavilion in left field to claim our challenge medals. I then had to go back down the stairs to the field to find Candace as she finished the race. But hey, it is a nice SMO and was worth the wait. 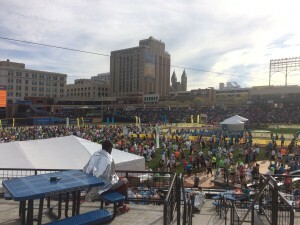 Canal Park is the site of both the finish line and the finisher’s village, which takes place on the outfield and includes plenty of food, beer, and live music. The area is nice, the grass is great to lay down in and grab a post-race snack, and the food was plentiful. The volunteers were efficient and helpful, and they deserve thanks and props. I did see a few runners trying – unsuccessfully – to sneak family and friends into the area, but they were turned away by security. The finisher’s village is exclusively for runners. It is a good time, but make sure you are aware of this when planning you day with non-runners. I used the same playlist that I used to PR at the Rock and Roll Hall of Fame Half Marathon, figuring that it might bring me good luck (it didn’t!). Interestingly, even though I really did not have that much of a race plan for this day, it just so happened to work out that I finished the race as I was on the very last song of the playlist. I could not have planned it out any better had I tried. Also, my headphones are dying a fast death and it was hard to hear the music at times because of this. While not optimal, I could hear the music – albeit softer than I would have liked for a race – and again, had to ascribe to my mantra: Accept. Adjust. Advance. This just goes to show that Casual Runners need to check all of their equipment before a race to make sure it is in proper working order. The team at the Akron Marathon continues to put on great events. I’ve said it before and I will say it again. For a city the size of Akron, they have no business putting on such great events of this caliber…and that is high praise indeed. 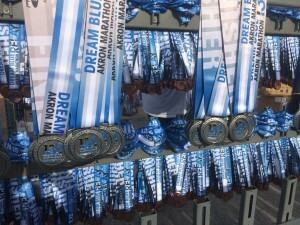 Akron is a great city, but it is a smaller city, and they have a jewel of a marathon organizing team that consistently puts on race events that are the envy of many much larger cities. So Akron, please appreciate what you have and continue to support this great event. Oh, and yes, please keep bringing us the blue line! For more great coverage of Akron running events, you can read about Mike’s first attempt at the relay event in his Worst Race Ever feature, his redemption story at the 2013 Akron Half Marathon, and his joy in following the Blue Line during the 2014 Akron Half Marathon. You can check out our Youtube Videos from the 2014 race weekend and the 2015 Rubber City Race Series [COMING SOON! ], which also included the Inaugural Thirsty Dog 8k and Goodyear Half Marathon.